I’ll never forget the first time someone asked if I might be depressed. I was mourning the loss of so much in my life and was crying inconsolably, almost daily. Yet somehow when Karen, who had come over to rescue me (again), asked, “Do you think you might be depressed?” my first impulse was “No way! Me?” After all, I got out of bed each day and managed to shower, take care of my kids, do my work. I wasn’t eating too much, or too little. I wasn’t suicidal. Certainly I couldn’t be depressed! Wouldn’t I know if I was? That’s the way depression is: sly and sneaky. It slips into your life when you’re not looking. Maybe you’re distracted by big changes that are out of your control, or you’re busy applying veneer to your life—the sort that will fool everyone else into thinking your existence is something it isn’t. Either way, you’re preoccupied, so you don’t notice Depression when it enters without knocking and takes up residence in an unused, cluttered corner of your world. At first, Depression mostly keeps to itself, taking up very little space, almost never in the way. Depression knows how to play the considerate houseguest. But gradually it starts to unpack and spread out, leaving a trail of it’s ugliness across your scrubbed existence. Depression is the master of the gradual everything. The weightiness, the pressure, is a cloud that gathers so gently you’re conditioned to its presence and growth. You hardly notice it, and maybe, if you do, you dismiss it as a minor irritation you can live with. Maybe distance is the only way to detect depression. You have to back far enough away from it to see the havoc it has wrecked—the mess it is making. My friend Karen had that distance, because although she was right there, observing my life, she wasn’t in my life. I have that distance too, now that I’m taking refuge on the other side. But I’m getting ahead of myself. What’s amazing to me now—almost a decade after I started taking anti-depressants and sensing some relief—is how long I walked down that dark path as if it was normal. I’m not saying I thought it was fun or pretty—not for a second. But I did somehow think it was my lot in life, walking through each day as if weighted down, held back from being the person I was created to be, incapable of doing the things I was meant to do. We have an amazing capacity to convince ourselves that whatever we’re experiencing is “normal.” It’s a survival mechanism, I’m sure—this ability to accept and adapt to what is and incorporate it into our lives—but the mental acrobats we perform to help us carry on can also do us in. Something has to snap us out of the life of dull monotones, giving us the perspective we need to see our lives in bright, vivid detail once again. For me, even all the crying, all the not-knowing what I wanted, had become “normal.” It took a friend uttering the word I had not uttered—depression—to get me to jump the endless tracks I was on and shift toward the possibility of something different. I can’t wait for my copy to get here so I can read your whole piece! That was my experience of depression- it became normal and I couldn’t see outside of that normal for quite some time. Later, distance lent perspective and showed me how depression impacted my life. That led to finally going to therapy, even though I hadn’t been clinically depressed in almost 5 years. Smartest decision I ever made! Kristin, I love your story so much and I love your heart even more. Thank you so much for your honesty and your generosity in participating in this project. I’m so thankful to have you as a friend! It’s this kind of honest account that will help others better recognize when depression is in charge of their lives, and hopefully it will encourage those people who are suffering to take steps to get it under control. Thank you, Kristin. 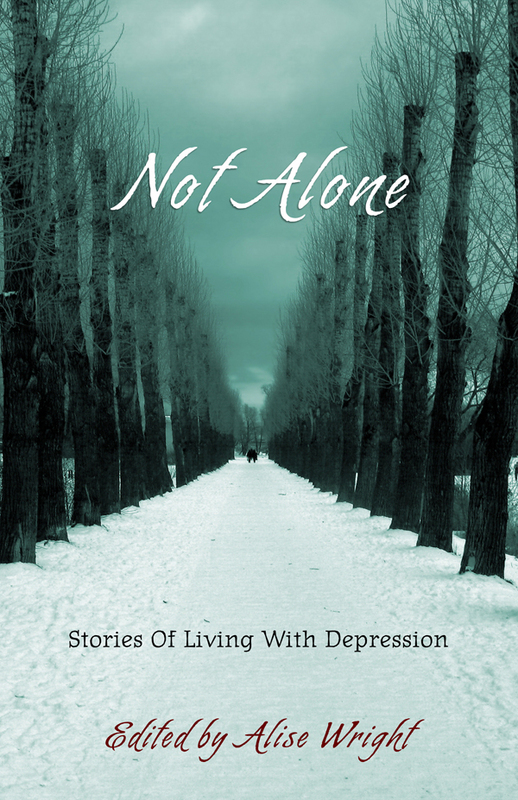 As one who has been through it, I’m grateful to you and others who share their stories of Depression. In most instances it so easy to control, yet so very many suffer needlessly. And those who matter to them suffer too. The comments alone are what make me proud that you came forward with this. I know you had some reluctance more than a year ago about discussing your experience publicly, but you and I both know that when something has a name, and when a community rises to lift you, amazing healing can happen. I am proud of you, and your commenters, and myself for refusing to give in to the beast and walking forward another day. Bless you, and bless this book. HopefulLeigh, isn’t it amazing what our minds will do to protect us in the moment? I think about how critical that protection was, in many ways, hundreds of years ago, when people didn’t have access to therapy and medication. Now we do, thankfully, so it’s important that we can get some distance and recognize how profoundly our depression is impacting our lives. Alise, I’m so thankful that our paths crossed and you decided to “go for it” with this project! What a powerful message of hope, healing and community. The Modern Gal, I definitely wish I had access to stories like these when I was in the heart of my depression! The sense of not being alone would have been so powerful then. Robert, you bring up needless suffering–I have to admit, it’s really difficult to think about the many years I was struggling under that weight and didn’t need to. I think the stigma of depression is one of the main things that sustains the denial. Sharing our stories can make a difference! Jennifer, I love this truth, and how you worded it: “…when something has a name, and when a community rises to lift you, amazing healing can happen.” Amen. What a wonderful project. Finally, finally, people are beginning to talk about depression. Depression is not imaginary, and one does not simply “snap out of it.” It’s comforting to read the about the experiences of others. Bringing it into the light will hopefully, gradually remove the stigma.